Have you seen any movie that features the armed forces before? Then you’ve already seen this film. Every was based cliché you can think of is here in Battle: Los Angeles. A good 20 minutes or so of the film is spent introducing us to each character who is part of this squad. Well, calling them characters is a bit of a stretch. One note clichés are more like it. There’s the marine who’s preparing for his wedding. The one who’s brother died in combat. The green officer who’s never seen combat before. Wash, rinse, repeat. They set all this up and really it’s a waste of time. By the time they get into combat, you can’t remember who is who, you don’t care who is who, and most importantly, it doesn’t matter who is who. These aren’t characters who you engage with over the course of the movie. They’re moving props who shoot guns and get attacked by aliens. What about the special effects? Yeah, they’re not too bad. I would have liked it better if we’d seen less of the aliens, made them more mysterious. Always out there but never easy to see. You know someone is attacking but you can’t tell who. Instead it feels like the more you see of these aliens, the less impressive they are. It doesn’t help that they’re near invulnerable at the start of the movie, but start dropping like flies towards the end so that the good guys can pull off a win. On a similar note, the camera work looks like the cameraman is suffering from some kind of seizure. The shaky cam works great when the ground in front of you is exploding. Not so much when two guys are talking quietly in an office before the fighting begins. Someone needs to tell the cameraman to take a deep breath and hold the camera still. There are two big ideas here that are sadly wasted. First was the use of aliens. The makers of this film fail to do anything story-wise or thematically with these antagonists. They’re not used in any clever way and don’t tell us anything new about ourselves. Contrast this with 2009’s District 9. In District 9 the aliens are used to challenge our thoughts about racism and immigration. In Battle: LA the aliens are used for target practice. A war between two armies of humans on the streets of LA would have been more intriguing. The second wasted idea is the location. The reason for setting a movie like this in a setting like Los Angeles is that it feels like it’s happening in your backyard. There should be a feeling that war is not just something that happens “over there” but could just as easily erupt on our (generally) peaceful streets. However, I feel Los Angeles was maybe a poor choice. With all the smoke and dust and rubble, it was hard to tell if this was LA or Afghanistan. Maybe that was the point. But I couldn’t help feel that this would have had a stronger impact if it was set in the suburbs or a city with a greener look. Even setting the movie in New York, with all those skyscrapers, would have provided a more interesting look. The idea that we are not safe from attack in our supposedly safe cities is one worth exploring. Too often we feel like all the bad stuff happens elsewhere, where our only exposure comes through the nightly news. It’s the same for Christians living in countries like Australia, where we have religious freedoms. We hear about the stuff happening to the persecuted church and we pray for them and feel for them. But we never really expect that kind of thing to happen here. That’s something that happens “over there”. Yet the Apostle Paul urges us to be constantly ready for the devil’s attacks. “Therefore put on the full armor of God, so that when the day of evil comes, you may be able to stand your ground, and after you have done everything, to stand.” (Ephesians 6:13) Notice how he doesn’t say if the day of evil comes? No, he says when the day of evil comes. We are to be prepared always for persecution and the devil’s attacks. We are not to be caught unawares, but wear the full armor of God. Just as LA found itself at war, we are to be ready for a spiritual war at any moment. 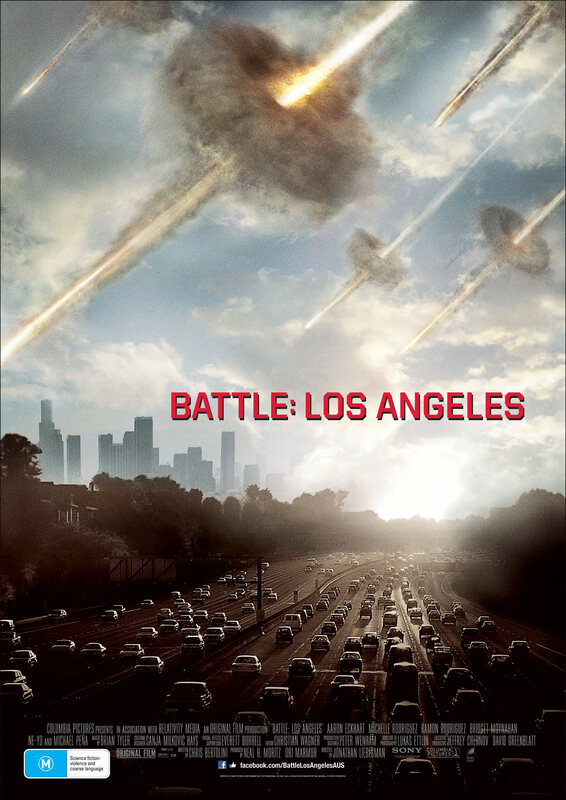 This review makes Battle: Los Angeles sound like a terrible movie. There are an incredibly large number of things wrong with this film. But only if you’re expecting the movie to be good. If your idea of an enjoyable movie is to see a squad of marines shoot things and make other things go explodey, then Battle: Los Angeles is worth the price of admission.